O4 - HKLM\..\Run: [futwpyxu] regsvr32 /u "C:\Documents and Settings\All Users\Application Data\futwpyxu.dll"
O4 - HKCU\..\Run: [QdrModule13] "C:\Program Files\QdrModule\QdrModule13.exe"
I'll run the ComboFix as well. Edited by stuckwithvirus, 02 March 2008 - 10:03 AM. 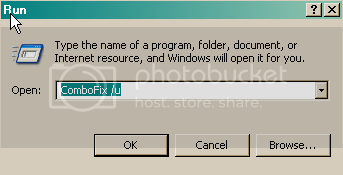 "2008-02-21 08:17:01 C:\WINDOWS\Tasks\MP Scheduled Scan.job"
Nothing happens if I drag the txt file onto the ComboFix.exe icon and I can't get the program to run at all. In fact, if I bring up a DOS prompt, I get nothing - no drive, no prompt, so I can't type anything to start it manually. I was able to get the ComboFix utility to run as a different user (r-click -> run-as -> select different user). I'll try to figure out how to send the file as a parameter. not sure about that it is odd. Please open up Notepad and copy all of the items in the code box below. Reboot and post back with that log and a new Hijackthis log. The computer appears to be better - background is normal again! I am running the Malwarebytes scan again, to make sure there is nothing left. I will be leaving for the airport in a few minutes, but will try to check this post before I board the plane. Please confirm if there are any additional steps I need to take. Regardless of whether or not we clean the entire computer up, I can't thank you all enough for spending the time to help me out (especially Kahdah). If I am able to close this deal, I promise to contribute as much as I can to this cause. You guys are great! Final scan came up with ZERO malicious files detected (after initially finding over 200 files over two scans)! You guys are the best! Thanks again!